Theresa May is set to face calls to name the date of her departure as she faces Conservative MPs on Wednesday ahead of a set of votes to alter the direction of Brexit. There were signs that the Prime Minister is winning over some Tory rebels in her last-ditch bid to force her EU Withdrawal Agreement through Parliament by Friday’s deadline. 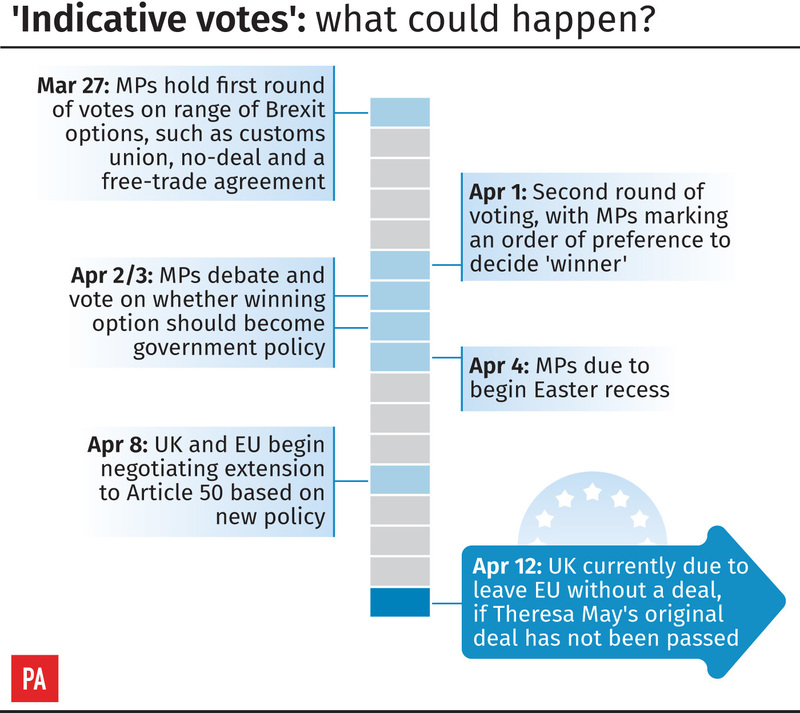 But MPs have seized control of the House of Commons agenda to force votes on alternatives to her plan – including a call for a public vote on any deal and a demand for Parliament to choose between no-deal and no-Brexit if the UK gets within two days of crashing out. In a highly unusual change to normal Commons procedures, MPs will be asked to take part in a paper ballot on a series of “indicative votes” in the hope of establishing what sort of Brexit could command a majority in Parliament. Immediately before the votes, the Prime Minister will address Tory MPs at a meeting of the backbench 1922 Committee, where she is expected to seek further support for her Agreement, rejected by 230 votes in January and 149 in March. The Agreement, and a Political Declaration on future EU/UK relations, must be passed by Friday if the UK is to benefit from an automatic delay in the date of Brexit to May 22. If not, it has to April 12 to make new proposals or leave without a deal. Meanwhile, an influential critic of the Agreement, the chair of the European Research Group Jacob Rees-Mogg, said he was ready to back the deal so long as it wins the support of the DUP. Conservative MP Nigel Evans, a joint executive secretary of the 1922 Committee, made an open call for Mrs May to “give the timetable for her departure” at Wednesday’s meeting. Mr Evans told BBC Radio 4’s PM: “A number of Brexiteers are reluctant to support her deal because they think if it gets over the line, she will then say ‘Look what I’ve achieved, I’m staying’. “A number of them want to make absolutely certain she’s nowhere near the negotiating table when we start talking about the future trade relationship with the EU. But other former rebels urged fellow Tories to get behind the PM, warning that otherwise the Brexit process might slip out of their control. ERG member Daniel Kawczynski said there was “definitely a palpable shift” among Leavers deciding they must come together behind Mrs May’s deal as “the least worst option”. The DUP has so far given no indication it will end its opposition. DUP Brexit spokesman Sammy Wilson told the Telegraph that some former opponents of the deal “now take the view that the Withdrawal Agreement, even though it is a rotten deal, is better than losing Brexit”. Mr Wilson suggested that a long extension to Article 50, keeping the UK in the EU, was a better option even if it meant leaving without a deal at the end. The ERG were due to meet before Wednesday’s votes to discuss tactics, though it was not clear whether they will act as a bloc. The group has not tabled a motion, though individual members have. Labour has tabled its alternative Brexit plan – featuring a permanent customs union with a UK say on trade deals and close alignment with the single market – as one of the indicative vote options. And there was speculation the party would back a motion tabled in the name of former foreign secretary Dame Margaret Beckett, requiring a public vote before ratification of any Brexit deal, after shadow foreign secretary Emily Thornberry predicted it would be “popular”. A motion from SNP MP Joanna Cherry demands a vote in Parliament to approve a no-deal Brexit two days before it happens, with the automatic revocation of Article 50 if it fails. Other options on offer include a new customs deal; a Norway-style “Common Market 2.0” plan; and the so-called Malthouse Compromise, which would enact Mrs May’s deal with the controversial backstop replaced by alternative arrangements for the Irish border. MPs will not be given the opportunity to express their views on Mrs May’s deal, as the Government has not tabled any motion for the indicative vote process. No final victor is expected to emerge from Wednesday’s votes, but the most popular options will be subject to further debate on Monday to try to whittle the list down. Mrs May must table a motion for a third “meaningful vote” on her deal by the end of Wednesday if it is to be debated on Thursday. 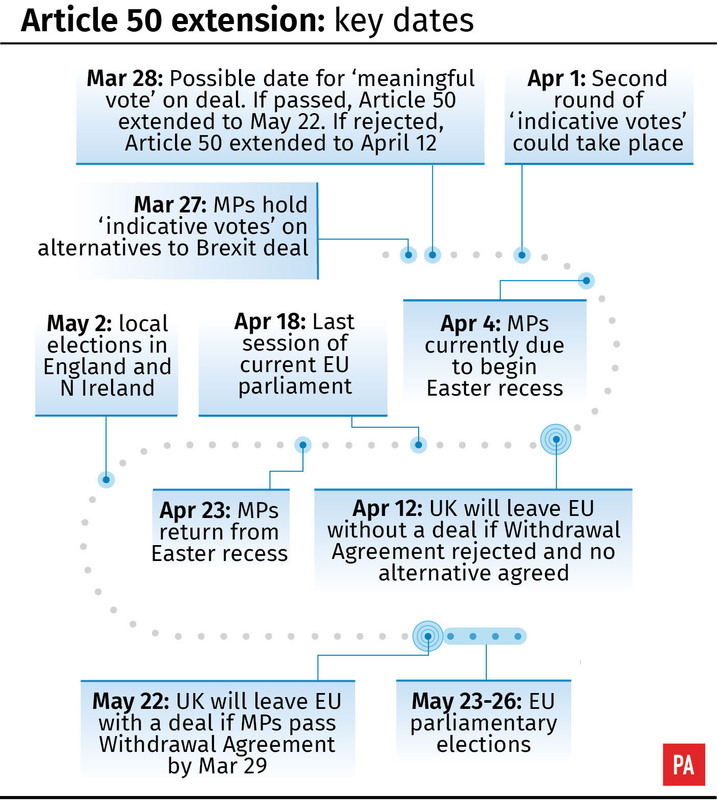 If it comes any later, she would have to ask the Commons to sit on Friday March 29 – initially marked out for Brexit day and currently listed as a non-sitting day. However, she will also need to persuade Speaker John Bercow that it is not a simple re-run of an earlier vote. Meanwhile, Mrs May was facing the threat of possible resignations if she tries to whip ministers for the indicative votes. And four ERG members, led by Sir Bill Cash, have warned of “serious legal objections” to a statutory instrument being debated on Wednesday to delay Brexit beyond March 29. In a letter to Mrs May, the MPs said the extension agreed at last week’s EU summit could amount to an unlawful use of the Royal Prerogative and a breach of the Vienna Convention on treaties.